Mumbai has some renowned restaurants and pubs that offer cheap beer, a lively atmosphere, and somewhere to catch up with friends or other travelers. 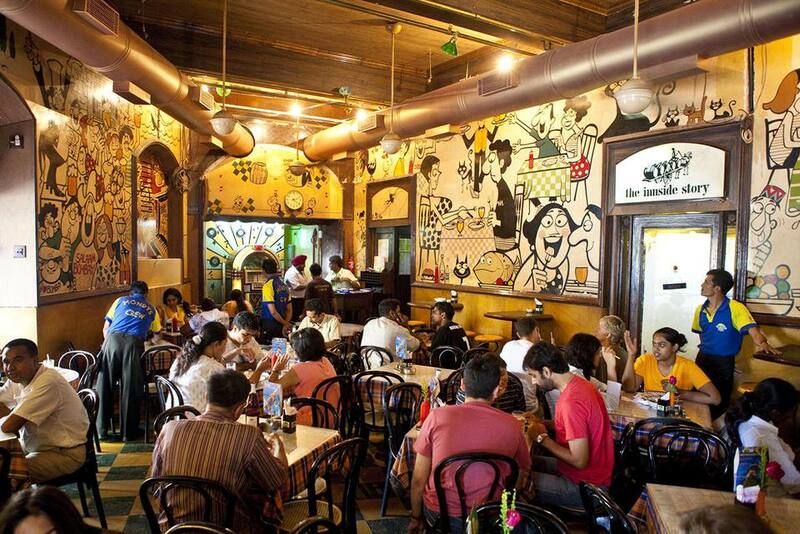 Check out these popular Mumbai hangouts, all conveniently located in the Colaba tourist district. Some are iconic establishments that have been around for more than a century, while others have only recently opened up. Music is the motto at Cafe Mondegar, and it pumps from the jukebox throughout the day and night. Retro rock is the usual flavor, although jazz and pop are also on offer. The continental food served provides a welcome alternative to the usual Indian fare, and the breakfasts are especially good. Beer and wine are the only alcoholic beverages available. Beer costs 220 rupees for a mug or 880 rupees for a pitcher. It's always busy here but the friendly, smiling staff make sure everyone's well looked after. Features: Interesting artwork from acclaimed Indian cartoonist Mario Miranda and a jukebox loaded with music. Location: Corner of Colaba Causeway, next to the Regal Cinema, Colaba. Phone: (022) 2202-0591. Opening Hours: 7 a.m. until midnight. Established in 1871, Leopold's is perhaps Mumbai's most famous cafe. It gained further notoriety after featuring in Gregory David Robert's epic Shantaram, which recounted his time in Mumbai, and being attacked by terrorists in 2008. However, Leopold's has moved on from its checkered past to find a prominent position on every traveler's must-visit list. It's packed with foreigners hoping to see bullet holes from terrorist gunfire (they're still there) and relive the Shantaram legend over huge pitchers of beer. If you're really feeling thirsty, get the beer tower for 1,600 rupees. Features: Dimly light upstairs area with DJ playing assorted tunes into the night. Address: Colaba Causeway, Colaba. Phone: (022) 2202-0131. Opening Hours: 7.30 a.m. until 1 a.m.
An upscale pub in Colaba, The Woodside Inn is renowned for its beers and burgers (in fact, it holds an annual Beer and Burger Festival). Downstairs there's a bar, while upstairs is the restaurant. The menu is European and a hearty breakfast is served until 5 p.m. If you're feeling a bit worse for wear, try one of their Hangover Cures! Features: Retro vibes and extensive selection of craft beers. Address: Indian Mercantile Mansion, Wodehouse Road, opposite Regal Cinema, Colaba. Phone: (022) 2287-5752. Opening Hours: 11 a.m. until 1 a.m.
Alps Restaurant & Beer Bar is a small, slightly seedy, simply decorated place that has laminated tables, hanging lamps, and pictures of Hollywood stars gracing its walls. Chill out there over some of the cheapest mugs and pitchers of beer you'll get in Mumbai. Sensational sizzlers, and fish and chips are also served. Features: Rock music, and sports on TV. Address: Roosevelt House, Nowroji Furdunji Road, Colaba (in the lane next to Cafe Mondegar, behind the Taj Hotel). Phone: (022) 2204-5042. Opening Hours: 11 a.m. until 11.00 p.m. If you don't mind dim and dingy, Gokul is the most popular dive bar in South Mumbai. Everyone from college students to corporate office workers go there with great enthusiasm for budget boozing. Although its rough appearance may not be very appealing, the crowd is surprisingly decent and there's an upstairs section that's less shady. Legendary roadside kebab restaurant Bademiya is in the same lane. Features: Food is served until 3.30 a.m. next door at Gokul Bites. Address: 10 Tullock Road, Nawaz Building, Apollo Bunder, Colaba. (022) 2284-8248. Opening Hours: 11 a.m. until after midnight. Effingut, where "beauty is in the eye of the beer holder", is the hottest new craft beer bar in Colaba. This branch of Pune's curiously-named microbrewery opened there in mid 2018 and its two floors have been consistently packed with customers ever since. The decor is as peculiar as the name: a motorbike suspended from the ceiling, taps lining one wall, and prop cameras in the toilets. Prices start from 245 rupees for a small glass of ale and 1,345 rupees for a pitcher. There are live bands on Thursday nights, DJs on Fridays and Saturdays, and acoustic and classic rock music on Sundays. And of course, plenty of large screen TVs for watching sport. Features: A beer tasting platter and beer cocktails. Address: Dhanraj Mahal, Apollo Bunder, Colaba. Phone: (022) 3312-6941. Opening Hours: Noon until 1.30 a.m. The Colaba Social is a happening hipster hangout that's collaborative work space by day and high-energy bar by night. Head there if you want to drink beer that's a step-up from the ubiquitous Kingfisher. Craft beers start from about 250 rupees each. There are many other tempting alcoholic drinks available too. Features: Innovative presentation of food and drinks. Vast and well-researched menu offering eclectic street food from around the world that's served in a fun and unconventional way. Address: 24 Glen Rose Building, B.K. Boman Behram Marg, behind the Taj Hotel, Apollo Bunder, Colaba. Phone: (022) 2282-8484. Opening Hours: 9 a.m. until 1 a.m. Innovative Bar Stock Exchange allows customers to trade in alcohol, similar to a stock market. Prices rise and fall according to demand, and are displayed on LED screens. The bar's designer interior is rather dark and sombre for a revolutionary bar with party atmosphere though. Address: 22 M.B. Marg, Apollo Hotel, Colaba. Phone: (022) 2281-9898. Opening Hours: 8 a.m. (for breakfast, in case you're hungover from the previous night) until 1.30 a.m.